BlackBerry Z10 failed to revive BlackBerry and now the company is set to launch its next phone BlackBerry Z30 in India on October 24 next week. With uncertainty hanging around BlackBerry’s future, it will be still tougher for this handset to make its place in the competitive market. Does it pack what it takes to be a viable option for buyers? Let’s find out. BlackBerry Z30 sports a 5 inch 1280 x 720 pixels Super AMOLED display with 295 ppi, both the pixel density and pixels have been reduced as compared to 4.2 Inch Z10 display with 1200 x 768 pixels and 355ppi. The difference won’t be that noticeable to the eye and we expect this display to be more suited to BB10.2 operating system and provide with a better experience. This phone will be powered by Qualcomm Dual core processor clocked at 1.7 GHz. The GPU on this chipset is Adreno 320 which is similar to what we find on Snapdragon 600. The handset will also feature 2 GB of RAM and 16 GB of internal storage which can be extended to 64 GB using a microSD card slot. Primary Auto- focus camera is of 8 MP and is capable of recording 1080 p Full HD videos at 30 fps. The front camera of 2 MP is capable of HD video recording. The battery capacity is pretty good at 2880 mAh, but the battery is not removable in spite of the removable back cover. Connectivity features include NFC, 3G, WiFi, GPS with A-GPS and GLONASS, Bluetooth 4.0 and USB OTG support. This phone weighs 170 grams and looks and feels quite premium as is expected from BlackBerry high end smartphones. The carbon fiber back cover with BlackBerry logo in the center looks quite premium as well. BlackBerry is in tough waters. 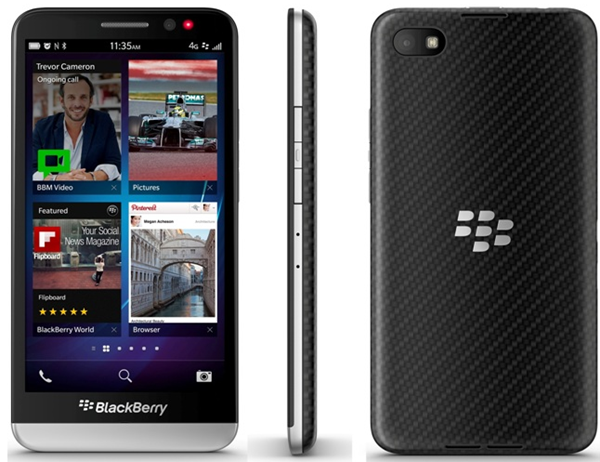 Company recently announced that it suffered a loss of 1 billion dollars due to its unsold Z10 smartphones. Halting of BBM roll out for android has made a mockery of the company and further hampered their reputation. Does this means hopeless future for Z30? The uncertainty hovering around the Blackberry platform makes it a probable yes. The pricing of this phone will be very crucial and will be revealed on 24th august at the launch event. With the expected price range of 35,000 to 40,000 INR, it will face tough competition against Android big guns like HTC One and Samsung Galaxy S4.